–Best Buy, this week, apparently has no printed Sunday flyer. After a few pretty eventful weeks of new releases, things are cooling off a bit this week. And I checked numerous places but could find no Best Buy flyer for the week. Hope everyone has a terrific week. Safe shopping! Very quiet week for me. Which is good, I guess. Thanks as always, Mike. Thanks Mike and Happy Easter or Passover to all. So, nothing for me this week. After spending way too much money last week, I'm happy to see that there's nothing for me this week. Thanks for the prices, Mike. Apart from one movie, it's a free week for me, too. For those who haven't seen it and like mystery thrillers, A Study in Terror is an excellent Sherlock Holmes mystery where the great detective faces off against Jack the Ripper. It's a simpler scenario than Murder by Decree (which also pitted the Ripper against Holmes), but Holmes and Watson are played superbly by excellent if lesser known actors (John Neville and Donald Huston), and the period is decently portrayed (if admittedly on a small budget). Georgia Brown (the original Nancy in the stage version of Oliver! in London and New York) is around to warble a couple of music hall ditties and the very young Judi Dench can be seen in some scenes, too. Well, it WAS going to be an empty week for me. Glad it is a slow week, after some great sales from Warner Archive, Kino, and Deep Discount. 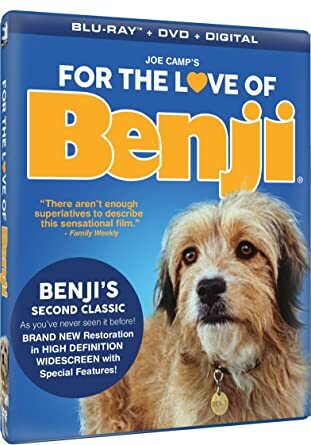 As I have done for the last few weeks, I again cancelled my pre-order at Amazon and bought For the Love of Benji from Deep Discount at a much better price. Seems Amazon is no longer trying to be the lowest price anymore. BB is finally advertising both of their UHD bundle deals together in the ad. About time. There's a chance I pick something up…but we'll see. I'm not committed right now. Target is having a "sale" online on select 4k's. Last Jedi, Jumanji (27.99), Blue Planet II (44.99), Blade Runner 2049, Guardians 2, Wonder Woman (25.49), Atomic Blonde, American Assassin (21.24), Interstellar (21.92), Miss Peregrine's (22.94), Daddy's Home 2, Jigsaw (21.24). Not much of a sale, to be sure. Blade Runner 2049 4K is $19.99 on Amazon right now. I would post the link but it's been a while since I've posted a deal and can't remember if there are restrictions on links to retailers, so I'm leaving it out just to be safe. It's part of the 3/$50 bundle if you can find two other 4k's on the list you like, too. Ooh, is there a page that lists the qualifying titles or is that all 4K discs? That should work, hopefully. If not, go to BestBuy.com and click on the weekly ad. These titles have been 3/$50 for a few weeks now.